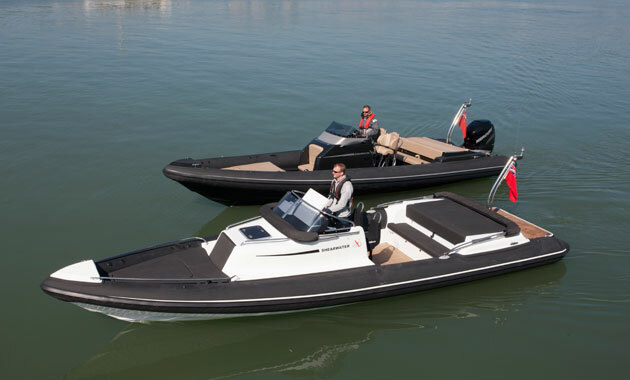 Bembridge Marine reckons its new Shearwater 890 fills a gap in the market for a 9m RIB with all the style and ability of a superyacht tender but without the accompanying six figure price tag. The 890 certainly fills the first part of the brief with its glossy black mouldings, tapered hypalon tubes and classy suspension seats, and thanks to a starting price of £89,499 inc UK VAT it satisfies the end part to. But what about the bit in the middle, namely its ability? A full day out in the Solent putting the deep vee hull and 300hp Mercury Verado outboard through their paces provided more good news on that front, too. The engine is an absolute peach revving as smoothly and sweetly as a BMW straight six all the way up to a top speed of exactly 50 knots. Even flat out it sounds and feels so comfortable that cruising at 40-45 knots soon becomes the norm in anything approaching flat water. The electronic throttle ensures super-soft gear changes when manoeuvring around the marina, although its location to port of the wheel means having to operate the trim button with the little finger on your left hand rather than the thumb of your right hand as intended.